This airticle is aboot the concept in Hinduism. For the 2009 film, see Avatar (2009 film). For the computin uise, see Avatar (computin). For ither uses, see Avatar (disambiguation). 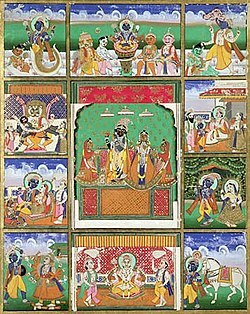 An avatar (Sanskrit: अवतार, IAST: avatāra) is a concept in Hinduism an it means "strynd", an refers tae the appearance or incarnation o a deity on yird. This page wis last eeditit on 26 Julie 2017, at 17:00.